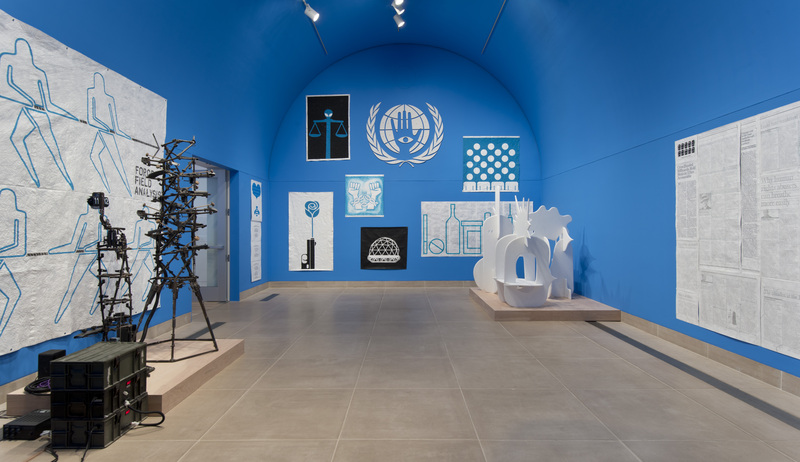 Mexican artist Pedro Reyes’s project The People’s United Nations (pUN) is both an exhibition and an event that puts the diplomatic and global problem-solving goals of the United Nations in the hands of ordinary people. Originally staged at the Queens Museum of Art, Reyes’s Hammer Project will include a group of sculptures—including Drone Dove and Colloquium—and several paintings on Tyvek that graphically portray political, social, and environmental issues being faced by our world today. The works reflect the underlying goals of peace and dialogue proposed by the project. The pUN General Assembly (May 2–3, 2015) was an experimental gathering of volunteer citizen-delegates from as many of the 195 member and observer states of the United Nations as possible. Unlike the real United Nations, where delegates are appointed by states and are career diplomats, the people’s UN enlists regular citizens who live in the Los Angeles area and are connected by family ties or by birth to the nations represented at the UN. Participants engaged in activities in the Hammer’s courtyard that tested Reyes’s hypothesis that conflict-resolution techniques used in social psychology, theater, and art can help solve the world’s most challenging problems, from climate change, to fair wages for women, to food shortages. Over the course of two days, this group used theater games, group therapy, and techniques from social science to grapple with a set of urgent and sometimes unexpected proposals. Playfulness, humor, and experimentation are strategies that allow for creative solutions and imagining a better future. 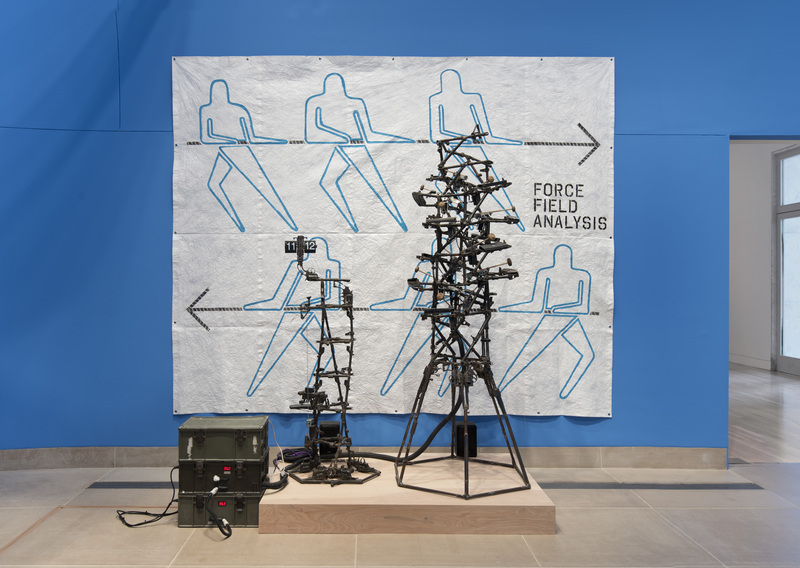 Hammer Projects: Pedro Reyes is organized by senior curator Anne Ellegood and MacKenzie Stevens, curatorial assistant. The People's United Nations (pUN) General Assembly is organized in collaboration with Allison Agsten, curator, Public Engagement, and January Parkos Arnall, curatorial assistant, Public Engagement. The pUN delegates are researched and coordinated by curatorial project consultant Carolina Guillermet. First conceived and presented at the Queens Museum in 2013, whose building was the site of the United Nations from 1946-1950. Hammer Projects: Pedro Reyes is supported by Bettina Korek and Alexandra Shabtai. 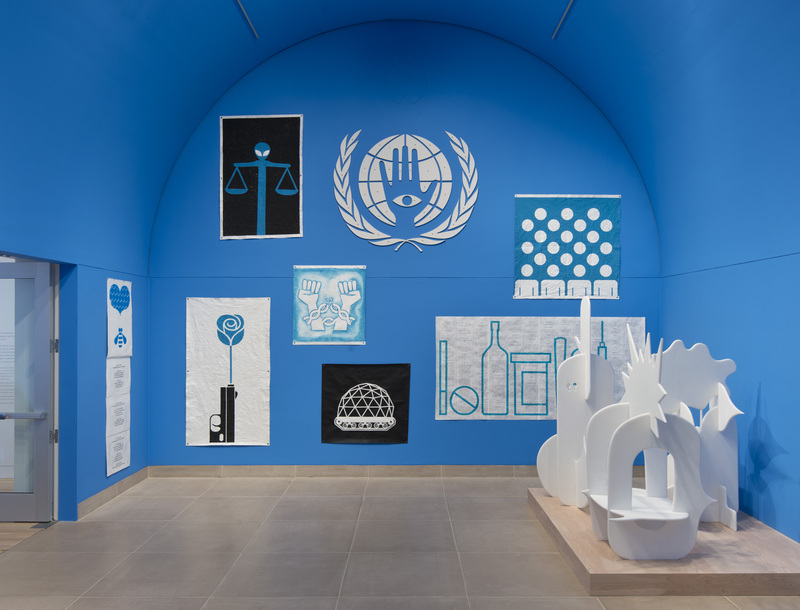 Mexican artist Pedro Reyes’s project The People’s United Nations (pUN) is an experimental gathering of volunteer delegates connected by family ties or by birth to the 195 members and observer states of the United Nations. Participants will engage in activities that will test Reyes’s hypothesis that conflict-resolution techniques used in social psychology, theater, and art can help solve the world’s most challenging problems, from climate change, to fair wages for women, to food shortages. If recent headlines are a reliable barometer of the state of the world— “43 Missing Students, a Mass Grave and a Suspect: Mexico’s Police”; “Egyptian Judges Drop All Charges against Mubarak”; “Boehner Says Obama’s Immigration Action Damages Presidency”; “U.N. Panel Issues Its Starkest Warning Yet on Global Warming”— then it seems that we are living in an age of intense violence, unbridled corruption, purposeful gridlock, and such persistent environmental degradation that frequent drought, flooding, and hurricanes have become the new normal. Citizens of countries around the world—even those founded on the ideals of democracy and governments of, by, and for the people—feel increasingly powerless in today’s political climate. Another headline (from 2013 and backed up by a Gallup poll) indicates that the root of this malaise—at least in the context of American life—is the government: “Fewer Americans Than Ever Trust Gov’t to Handle Problems.”1 Given this stark reality, perhaps it is time to consider alternatives to our standard political and diplomatic processes. What if solving even our most challenging and sometimes seemingly insurmountable problems was put in the hands—and the brains—of the public for whom government is supposed to work? If the United Nations remains the best role model for cooperative efforts to maintain peace internationally, protect human rights, and provide humanitarian aid, then what if we established a United Nations made up of ordinary people rather than diplomats? This is the proposal put forward by the Mexican artist Pedro Reyes in his project The People’s United Nations (pUN). pUN consists of both an exhibition and a performance in the form of a two-day gathering of delegates— everyday citizens connected by birth or family ties to the 195 member and observer states of the United Nations who volunteer their time as participants and come together to experiment with peaceful problem-solving. Reyes’s project embraces nontraditional conflict resolution techniques rooted in creativity to test the idea that they might be useful in conjunction with more standard diplomatic procedures to help advance humanitarian efforts and social reform. It is fitting that the acronym for The People’s United Nations is pUN, as humor and role-playing have long been central to Reyes’s work, which has for the past fifteen years taken up intense, overwhelming, and even dire subjects but with a decided and deliberate sense of optimism. Reyes taps into specific exercises and theoretical practices in which play and humor are considered both therapeutic and productive, and the pUN delegate gathering uses avant-garde theater games, group therapy, and conflict resolution techniques to grapple with and propose solutions for several critical issues affecting our world today. Indeed, Reyes’s pUN, like all puns, can be understood to have two meanings (or two positions): a lighthearted interpretation of the notion of the global conference, which ultimately functions as a gathering of local communities, and an overtly political action intended to remind the public that we have the power to create change and to teach tools for the potential radical liberation of citizens. On the wall outside the gallery is the pUN seal, an image of an open hand with an eye at the center of the palm, placed in the middle of a globe and surrounded by two olive branches. The seal is inspired by the hamsa (which translates into “five” in Arabic), a palm-shaped amulet recognized for millenia as a sign of protection, a defense against the “evil eye.” Popular in North Africa and the Middle East, the hamsa predates Christianity and Islam. It also brings to mind other widely used images of the hand, from universal icons like the peace sign or the raised palm to signal “stop” to symbols of political movements like the fist of the black power movement or the handshake on the American Federation of Labor logo. pUN’s motto is “Hands-on with a vision,” and the upheld and open palm suggests a salute or a greeting of sorts. For Reyes, the five fingers placed over an image of the earth represent the five continents, forever connected no matter how far apart they may at times seem. The gallery installation consists of three sculptures and several paintings on Tyvek, a quotidian durable industrial fabric used for such things as protective covers for packaging, reusable garbage bags, and banners. The sculptures reflect the sincere desires embedded in the larger project: peace, open dialogue, and an end to violence. 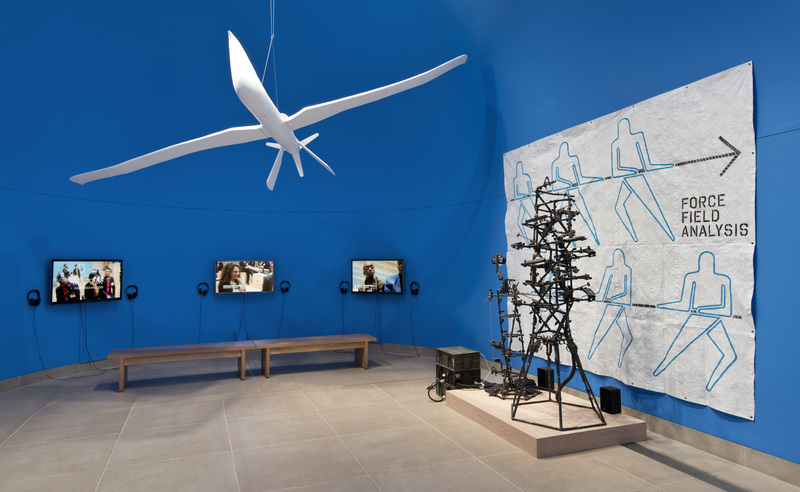 Conflating the universal symbol for peace with the form of an unmanned aircraft used by the US military in Afghanistan, Pakistan, and elsewhere, the Drone Dove (2013) soars above visitors’ heads, at once ominous and beautiful. Disarm/Clock (2013)—one of a group of works started in 2008 in which weapons collected by the Mexican army and city governments are transformed into peaceful tools for the betterment of society and culture—functions as both a timepiece and an instrument, programmed to perform on its own at regular intervals. Recognizable elements of rifles, shotguns, and pistols have been rendered harmless and now move sonically and rhythmically in space to create an elaborate percussive composition. The interlocking marble pieces of Colloquium (2013) come together to create a sculpture reminiscent of the formally inventive works of twentieth-century abstract modernists, most explicitly Isamu Noguchi. 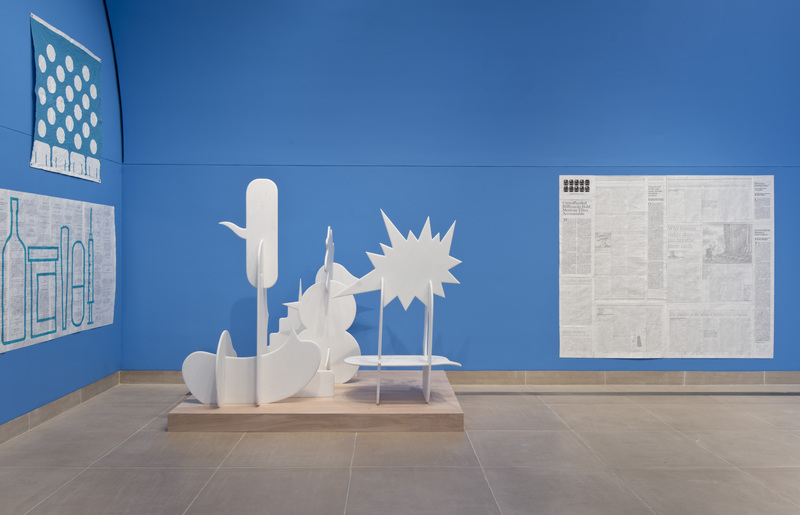 With a mischievous nod to Noguchi, Reyes composes Colloquium out of a selection of speech bubble forms, inserting a dose of popular culture and meaty subject matter into an otherwise formal language. Intersecting in what appears to be a precarious balance, the shapes each represent a different voice, opinion, or language. As a whole the work suggests the type of open dialogue, or heated debate, necessary for mutual understanding and problem solving. Hung densely on the gallery walls are a number of Reyes’s paintings on Tyvek. Painted in ink and acrylic in a cheerful shade of blue repeatedly employed by the artist in The People’s United Nations, each depicts a graphic icon that corresponds to one of the activities to be enacted at the delegates’ conference. Force Field Analysis, for example, refers to the social scientist Kurt Lewin’s theory analyzing the factors encouraging progress toward accomplishing a goal or, on the contrary, hindering such progress. The icon for Grasswhopper, in contrast, portrays a culinary innovation created by Reyes and chef Regina Galvanduque, a burger whose patty consists of crickets. The recipe was developed in response to environmentalists’ call to reduce consumption of meat—which has been linked to higher greenhouse gas emissions and alarming levels of deforestation, among other concerns—and replacing it with insects, which are already used as a protein source in many developing countries. Reyes employs rather charming icons that bring to mind grassroots civil disobedience movements—a rose coming out of the mouth of a gun, a Buckminster Fuller–like dome atop a tank, a bumblebee flying toward a hive-patterned heart—but are graphically sophisticated in that their simple lines and bold presence make them exceedingly memorable. Admittedly borrowing the visual language of the designer Lance Wyman, Reyes similarly aims to send strong messages through minimal means that speak to our contemporary moment. During the experimental two-day gathering on May 2 and 3 in the Hammer Museum’s courtyard, terrace, and theater, the delegates will tackle important issues such as the collapse of bee colonies; the digital age’s impact on our expectations of privacy; the increasingly pronounced economic inequality throughout the world, which leaves resources under the control of few; increased military spending at a time when basic human needs related to shelter, food, and medicine are not being met; and worldwide drought and the impact of water shortages. Participants work together in pairs or larger groups, with some activities led by experts in fields such as psychoanalysis and geo-engineering while others are guided by staff, volunteers, or actors. Reyes argues that without a willingness to use humor, the magnitude of the challenges we face as citizens of the world would quickly overwhelm us. Creating a situation—a happening for the twenty-first century—that embraces the possibility that a truly engaged and committed global forum can make a difference reinscribes the ideals of the United Nations with a sense of optimism. Perhaps most importantly, pUN provides a platform for everyday people—just like you and me—to have a voice. It argues that every opinion matters, not just those of “experts” or professional diplomats, and it creates an environment in which we can recognize our capacity to change the future of life on earth. 1. Joy Wilke and Frank Newport, “Fewer Americans Than Ever Trust Gov’t to Handle Problems,” Gallup.com, www.gallup.com/poll/164393 /fewer-americans-ever-trust-gov-handle-problems.aspx. Hammer Projects is made possible by a gift from Hope Warschaw and John Law. Generous support is also provided by the Horace W. Goldsmith Foundation and Susan Bay Nimoy and Leonard Nimoy. Additional support is provided by Good Works Foundation and Laura Donnelley, the Decade Fund, and the David Teiger Curatorial Travel Fund. The pUN General Assembly is organized with assistance from the Burkle Center for International Relations at UCLA.